Fiona the hippo was the first Nile hippo born at Cincinnati Zoo in 75 years. Fiona the hippo is the viral star splashing her way into hearts and onto the screens of millions around the globe. Fiona was born six weeks early. And she's since gone on to become a bonafide brand. The soon-to-be 1-year-old hippo was featured on merchandise, given her own ice cream flavor and was even the star of a campaign to have her chosen as Time magazine’s Person of the Year. (John Minchillo/AP) Fiona, a Nile hippopotamus, center, plays with her mother Bibi, in their enclosure at the Cincinnati Zoo & Botanical Garden, Nov. 2, 2017, in Cincinnati. So how did she become a celebrity? Fiona’s journey to stardom began in the womb. She was the first Nile hippo set to be born at the Cincinnati Zoo & Botanical Garden in 75 years. But Fiona almost didn’t make it. In the middle of the night, her mother, Bibi, went into labor dangerously early on Jan. 24, 2017. “She was quite cool to the touch. Her lungs weren’t strong enough and neither was her overall muscle control," Gorsuch said. Fiona weighed just 29 pounds. A typical newborn baby hippo weighs between 55 to 120 pounds. She was placed into a hippo neonatal intensive care unit of sorts, put on an IV and given round-the-clock care. The keepers and the zoo staff fought to keep her alive. Her daily struggle for survival was documented on the zoo’s Facebook page. Small moments became big victories, and the world watched as she learned to stand, swim and walk. (Angela Hatke/Cincinnati Zoo & Botanical Garden via AP) A baby Nile hippopotamus named Fiona rests her chin on the rim of a tub in her enclosure at the zoo in Cincinnati, March 23, 2017. 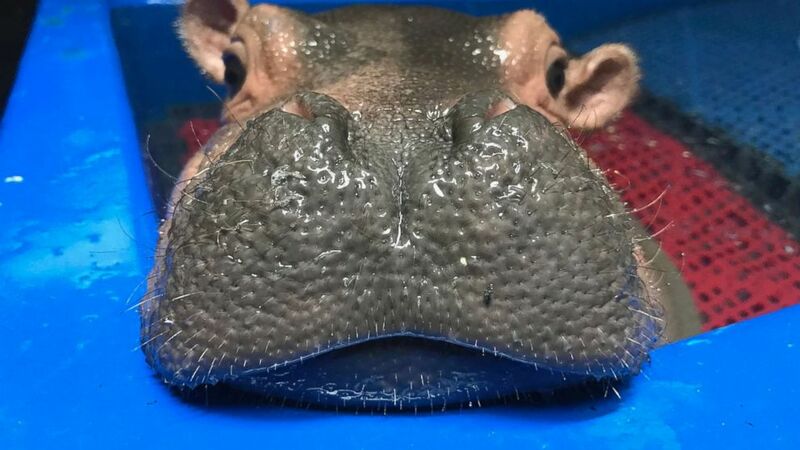 The zoo says the hippo, which weighed 29 pounds at birth and is the first Nile hippo born at the zoo in 75 years, is getting more independent and now tops 100 pounds (45.36 kilograms), meaning her days of napping on her human caretakers' laps are dwindling. Fiona continued to thrive and become stronger every day. 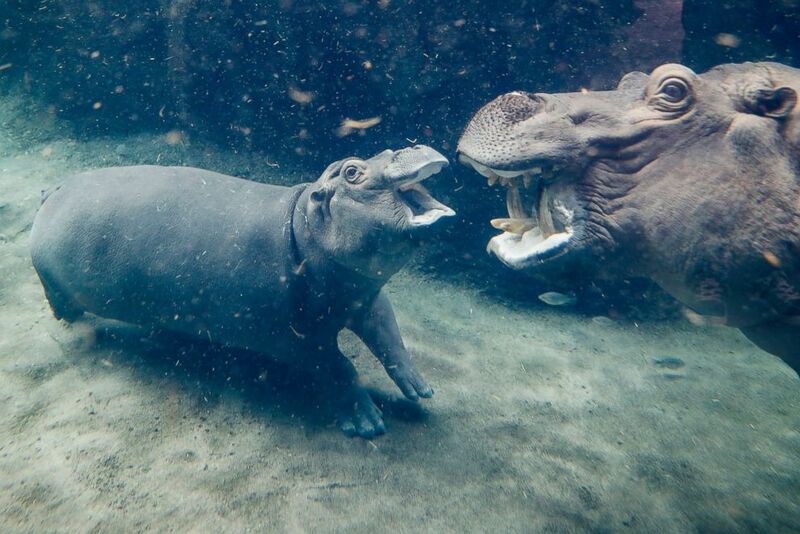 And as Fiona grew in size, so did her social media following. A video of Fiona learning how to walk up and down a ramp was viewed over 21 million times on Facebook, and she’s more than doubled the zoo’s following on Facebook from 322,000 followers to over 720,500 followers. And Fiona’s fame has also helped the Cincinnati Zoo hit record attendance, which was up 20 percent in 2017 from the previous year. Zoo officials call it the Fiona effect. Her spirit of resilience resonates with the visitors who come daily to see her swim and play, and her life’s story is now even being told in the book “My Best Friend Fiona” by Lucy May. Today, Fiona is happy, healthy and hefty. She will celebrate her first birthday on Jan. 24, and she is the smallest hippo on record to have ever been born and survive.